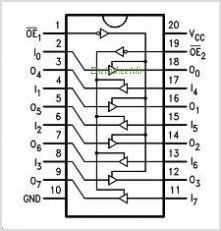 The 74F240 74F241 and 74F244 are octal Buffers and Line Drivers designed to be employed as memory and address drivers, Clock Drivers and bus-oriented transmitters/receivers which provide improved PC and board density. This is one package pinout of 74F244,If you need more pinouts please download 74F244's pdf datasheet. 74F244 circuits will be updated soon..., now you can download the pdf datasheet to check the circuits!